A big thanks to Ella Eckert and her cousin Gini for helping me with the blog this week! The girls had a blast making Won Ton Soup a few days ago. Flour was flying but Ella knew just how to make and fold the dough since she had taken a Chinese Cooking Class at a local college this summer. She and Gini prepared the won tons all by themselves. All I had to do was boil them! The name won ton means swallowing a cloud, and I guarantee you will see what that’s all about when you make the soup. The savory meat filling is a delicious compliment to the billowy dough. After boiling the won tons in the soup base, Gini and Ella removed the won tons with a spider skimmer and dipped them in some soy sauce. Last night, our family reheated the left-over won ton soup for dinner. Either way you choose to eat them, you will love them! Place flour in a large bowl, drizzle water over the flour. Mix dough with fingertips until well-combined (dough will be very sticky). Cover dough and set aside. In a large bowl, mix filling ingredients until well combined and set aside. Meanwhile, bring water, stock and green onions to a boil. Place 1/3 of the won tons in soup and keep soup at a simmer. When they rise to the top of the soup (about 8 minutes), gently remove them with a slotted spoon and place them on a tray or plate sprayed with cooking spray. Repeat with remaining won tons. 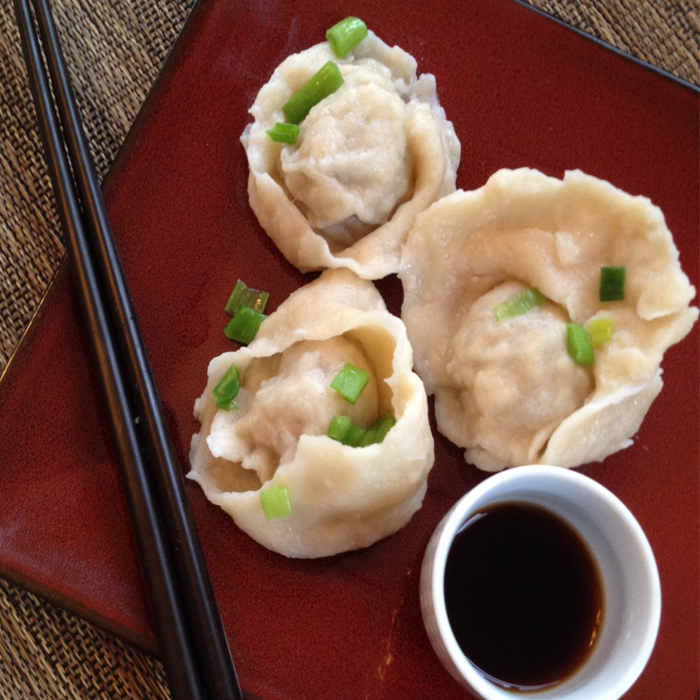 Serve won tons in a bowl of broth or with dipping sauce immediately. Or, store cooled won tons in broth for up to 5 days. Makes about 36 wontons.